The presence and influence of the Islamic State continues to spread in the civil war chaos of post-Qaddafi Libya, inserting itself into an already messy conflict between the rival Operation Dignity and Operation Dawn. Recent attacks in Libya by the so-called Islamic State, including the brutal slaughter of Egyptian Copts, the Corinthia Hotel attacks, car bombings in Qubbah that killed at least 45 people, and an attack on the Iranian embassy, have brought the spread of extremism in Libya to the forefront. While the Islamic State has intensified its activity in recent weeks, its spread into Libya began early in 2014 as Libyan jihadists began to return from Syria. Jihadi groups in Libya were already deeply fragmented and localized, but the rise of the Islamic State in Iraq and Syria in 2013 and 2014 sparked new debates, eventually dividing the Libyan jihadis between supporters of the Islamic State and supporters of al-Qaeda and its regional affiliates—mainly al-Qaeda in the Islamic Maghreb (AQIM) in North Africa and the Nusra Front in Syria. 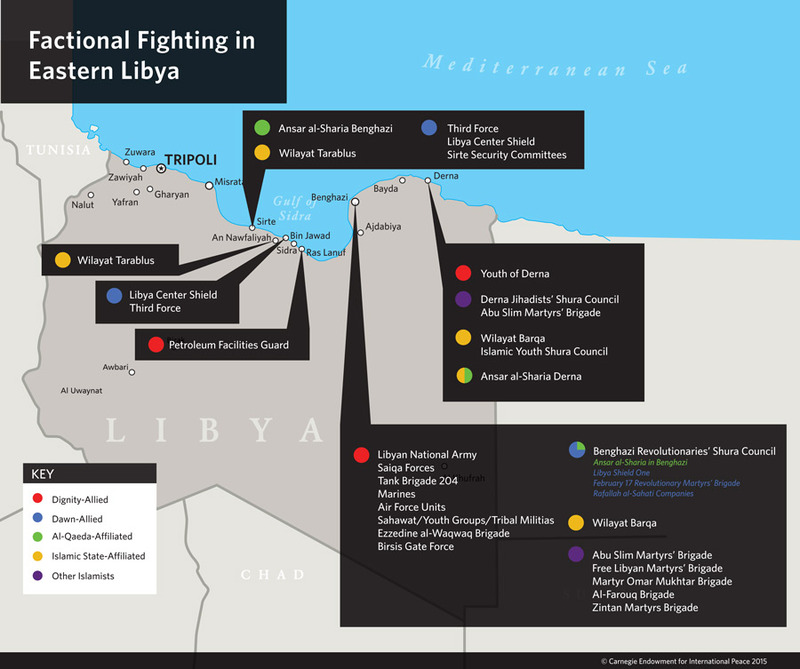 Libyans had already begun traveling to fight in Syria in 2011, joining existing jihadi factions or starting their own. In 2012, one group of Libyans in Syria declared the establishment of the Battar Brigade in a statement laden with anti-Shia sectarianism. The Battar Brigade founders also thanked “the citizens of Derna,” a city in northeastern Libya long known as a hotbed of radical Islamism, for their support for the struggle in Syria. Later, the Battar Brigade fighters in Syria would pledge loyalty to the Islamic State, and fight for it in both Syria and Iraq, including against its al-Qaeda rivals. In April 2014, the Battar Brigade announced the “martyrdom” of 25 of its fighters in a Nusra Front suicide attack on an Islamic State location. In the spring of 2014, many Battar Brigade fighters returned to Libya. In Derna, they reorganized themselves as the Islamic Youth Shura Council (IYSC). In September, an Islamic State delegation, including the Yemeni Abu al-Bara al-Azdi and the Saudi Abu Habib al-Jazrawi, arrived in Libya. After being received by the IYSC, they collected pledges of allegiance to the Islamic State’s self-appointed caliph, Abu Bakr al-Baghdadi, from IYSC-aligned fighters in Derna. They then declared eastern Libya to be a province of the Islamic State, calling it Wilayat Barqa, or the Cyrenaica Province. Even before the return of fighters from Syria became an issue, and long before the declaration of Wilayat Barqa, there were tensions between Islamists in eastern Libya. Many disputes concerned the Islamic legitimacy of Libya’s transitional governing authorities. Many former rebels—including Islamists—saw the post-Qaddafi government as broadly acceptable, and wanted to influence it from the inside. But the most hard-line factions condemned it for being based on democratic elections, relying on former members of Muammar Qaddafi’s regime, and failing to apply Sharia law. For example, in July 2011, Mustafa Abdul Jalil—a Qaddafi-era minister and pragmatic Islamist who defected and became the leader of Libya’s Western-backed National Transitional Council—visited Derna. An Islamist militia known as the Abu Slim Martyrs Brigades (ASMB) offered to guard him, but shortly after the visit, a religious ruling was published on the influential jihadi site Minbar al-Tawhid in response to a question about the propriety of protecting Abdul Jalil. The ruling condemned the National Transitional Council, and asked jihadists to “be guardians of [religious] doctrine, not protectors of those who seek to displace the Sharia.” Another Derna-based group of Islamists known as Ansar al-Sharia (not to be confused with the Benghazi-based jihadi faction of the same name) agreed with this hard-line view. Tensions later increased, especially after the ASMB was criticized by more hardline Islamists for protecting the July 2012 General National Congress elections, which Ansar al-Sharia viewed as un-Islamic. The arrival in Derna of Libyan jihadists from Syria added to the conflict. Initially, many of the returnees worked with Ansar al-Sharia against the ASMB. In May 2014, Mohammed Boubilal, an ASMB leader, was killed when his car exploded. Ansar al-Sharia in Derna and the IYSC were prime suspects. A few days later, Moatazz al-Miraash, reportedly a leader in both Ansar al-Sharia and the IYSC, was shot dead outside his house in Derna. Then, perhaps most significantly, one of the IYSC’s leading members, Mahdi Saad al-Ghaythi, was shot dead, reportedly while trying to bomb the house of a military leader in the ASMB. The IYSC’s declaration of fealty to Abu Bakr al-Baghdadi and the Islamic State further divided Ansar al-Sharia in Derna, with some members supporting the group while others followed al-Qaeda and professed allegiance to its leader Ayman al-Zawahiri. In May 2014, the retired General Khalifa Hifter launched a foreign-backed military operation dubbed Operation Dignity, which sought to purge Islamist forces from the Benghazi area. This spurred a temporary closing of the ranks among the Islamists, particularly because Hifter initially drew no distinction between Islamist groups that maintained relations with Libya’s Western-backed government, such as the Libya Shield One, and extremist anti-state jihadis like Ansar al-Sharia in Benghazi. The disparate Islamist militias combined their firepower and entered into a nominal alliance with other anti-Hifter forces. Even though many of these groups pursue Islamist politics, they are often more defined by their regional roots, with many based in western Libya, including in the cities of Tripoli and Misrata, or among ethnic Amazigh (Berber) groups. Together, Hifter’s opponents have called themselves Operation Dawn. Libyan politics is now dominated by the struggle between Hifter’s Dignity coalition and the rival Dawn forces. The political vacuum created by the civil war, and the perception among Libyan Islamists that Hifter is a more threatening common enemy, have enabled the Islamic State to grow. Groups that would otherwise be compelled to confront the Islamic State are no longer marshaling all their resources to do so. This dynamic is especially evident in eastern Libya. Despite their doctrinal and ideological divergences, the rejectionist al-Qaeda and Islamic State affiliated groups—as well as more pragmatic Islamist militias—have all fought together against Hifter’s forces in and around Benghazi, even as they have kept jostling for power in Derna and other areas. In August 2014, for example, the ASMB announced the death of eight of its members in Benghazi, and in mid-September, a senior IYSC member was also reportedly killed in the city. In addition to the declaration of Wilayat Barqa in eastern Libya, the Islamic State appears to be prioritizing its expansion in the west. On February 19, 2015, a convoy of Islamic State vehicles arrived at Sirte in central Libya and declared it Wilayat Tarablus (Tripoli Province). The group later moved to al-Nawfaliyah in the southwest, but withdrew on February 20 in the face of Egyptian airstrikes. There are also reports of growing Islamic State cells in Tripoli, Sabratha, and in the desert region south of Sirte. The propaganda value of such expansion is clear. It has facilitated high-profile attacks like the assault on the Corinthia Hotel in Tripoli and, more recently, attacks on oil fields like al-Bahi and al-Dahra located south of Sirte. All of this serves to raise the profile of Wilayat Tarablus, attract potential foreign recruits, particularly from Tunisia, and put additional pressure on Operation Dawn factions in the west of Libya. Sirte is an especially attractive site for Islamic State expansion given the long-standing presence there of fighters from the Benghazi-based faction of Ansar al-Sharia (both the Derna and the Benghazi branches of Ansar al-Sharia have been listed as terrorist groups by the United Nations). According to some reports, the Islamic State even dispatched a leading cleric, the Bahraini Turki al-Binali, to the city last year to win converts. Many Islamic State recruits in Sirte are reportedly defectors from Ansar al-Sharia; some are from Benghazi in the east, some are from Misrata, and some are local youth from the Furjan tribe. While there have been many reports about the Islamic State exerting total control over Sirte, especially after the university in the city closed, the actual extent of its presence is more limited. Sources inside the city say that the Islamic State probably has less than 100 vehicles in the city, and its fighters probably number between 200 and 400. Misratan militias, along with the Sirte Security Committee, are in control of key checkpoints and roads leading into the city. The Islamic State recently began staging attacks further south in what its members call Wilayat Fezzan. It announced its first attack there in early January 2015, when it killed nine members of the rival militia known as Southern Shield in Sukna. In mid-January, it was reported that the Islamic State had killed four soldiers in the Third Force, another militia, near Jufra. And in early February, the Islamic State attacked the Mabruk oil field near Jufra, and executed several workers. The most crucial issue for the Islamic State’s future expansion plans may be the fate of Misrata. Given its proximity to Sirte, Misrata is directly in the Islamic State’s sights—and in its way. Any move by the jihadist group into Tripoli and the west of Libya will have to confront Misrata’s powerful militias. Already there have been several propaganda overtures by the Islamic State to the city, including an open letter from Abu Moadh al-Barqawi addressed to the “youth of Misrata.” Barqawi asked them to sacrifice their lives for God instead of for democracy and the parliamentary government backed by Operation Dawn, and urged the Misratan fighters to repent and join the Islamic State. Reactions within Operation Dawn to the Islamic State’s advances have been split, which is perhaps no surprise, considering the loose and fluid structure of the Operation Dawn alliance. On the one hand, Libyan Islamists have stepped up their verbal attacks on the Islamic State. For example, Dar al-Ifta—Libya’s highest religious authority—has denounced the Islamic State’s “terrorist” actions as diverging from Islam. But on the other hand, some Operation Dawn sympathizers seem to be in denial about the problem. The Islamist-backed Prime Minister Omar al-Hassi has, for example, claimed that the Islamic State’s propaganda video of 21 Egyptian Coptic Christians being murdered is intended to serve as a pretext for Egypt’s intervention on the side of Hifter and Operation Dignity. Such statements have widened the gap between the Misratans fighters, who—whether Islamist or not—tend to view the Islamic State’s expansion into Sirte as a threat to their hometown, and other Operation Dawn factions in places like Tripoli. In interviews in January, several Misratan commanders acknowledged the growing threat from the Islamic State and sought to distance themselves from more radical elements in the Operation Dawn coalition. A key question now is whether these Misratan forces have the capacity and will to confront the Islamic State while also pursuing their battle against Hifter. Although Misratan fighters from the Third Force and Center Shield have surrounded Sirte, they are reluctant to attack for fear of opening a fourth front in their exposed rear areas. (Misratans are currently deployed to the west of Tripoli, in the southern city of Sabha, and in Bin Jawad, east of Sirte). The Misratan approach toward the Islamic State in Sirte so far has avoided direct military confrontation and has instead relied on elders and religious figures to negotiate with the militants. There are several ways in which the Islamic State could pick up increased support. The dislodging and dispersal of other hard-line Islamist factions could compel their youthful foot soldiers to join the Islamic State. Already there are signs of this happening among the Ansar al-Sharia groups in both Derna and Benghazi, although neither group has as of yet pledged its loyalty. The Islamic State in Libya may also benefit from the continued influx of foreign jihadists from Egypt, Tunisia, and Algeria, including hardened veterans of AQIM. Intervention by Egyptian troops on the side of Operation Dignity or the deployment of a Western peacekeeping force could provide the Islamic State with a recruiting ploy to attract an additional foreign fighter influx. In order to reduce the likelihood of a stronger foothold for the Islamic State in Libya, there needs to be a ceasefire, as well as cooperation between more pragmatic military elements from the Misrata/Operation Dawn coalition and Operation Dignity forces, which would erode the potential space for growth of Islamic State elements. As long as the civil war in Libya persists, the Operation Dawn faction will have incentives to downplay the Islamic State threat, to soft-pedal on confronting it or, even worse, to turn a blind eye as long as Islamic State fighters help in the battle against Hifter. For its part, Hifter’s Operation Dignity will have incentives to inflate the threat and use it as a pretext for marshaling international support against the entire Operation Dawn coalition. Both approaches are ultimately counterproductive over the long term. Regardless of which trajectory the civil war takes, the Islamic State may find its expansion hindered by two structural factors. First, the Islamic State will be unable to leverage the sort of broad-based sectarian grievances that have fueled Sunni support for the group in Syria and Iraq. Unlike Syria and Iraq, Libya has a homogenously Sunni population, and does not suffer from sectarian conflicts between Sunni and Shia Muslims. There is the possibility that the Islamic State could exploit the increasing resentment among tribal and communal groups that have been excluded from the new order—the deposed dictator’s Qadhadhfa tribe in the Sirte-Sabha region, for instance. But historically, jihadism in Libya has not had a distinctly tribal character, and many of the loyalist tribes are still throwing their lot in with Hifter and Operation Dignity. Second, the Islamic State currently lacks the capacity to provide administrative and social services. In war-torn Iraq and Syria, the Islamic State was able to raise money through ransoms and control of oil. In Libya, however, oil continues to be controlled by the state-run National Oil Company, such that the government controls foreign oil sales and then distributes revenues to both the rival Tobruk- and Tripoli-based governments. Even if the Islamic State were able to seize major oil fields, it would face a different and more difficult export environment than in Iraq and Syria. It will therefore lack the capacity to provide the salaries and social services that underpin the Islamic State’s power in Syria and Iraq. That said, the group could benefit in the future from an influx of funds from outside the country, kidnapping for ransom, or the seizure of existing smuggling networks. But it may find it hard to do this given the multiplicity of other actors vying for these same revenue streams. Moving forward, the group is instead likely to try to raise the appeal of its brand through high-profile attacks that can help it attract supporters from Libya’s splintering jihadist movements. It may also increase its attacks on the country’s oil resources in the hopes that it could tap into further economic decline to bolster its ranks. The authors are grateful for the assistance of Jocelyn Soly in designing the map. Dear Mr Wehrey. This time you truly got it 100% right. All we need is to tell all on the ground that this is the true analysis as shared by all . UN and all the friends of Libya whoever side they support or believe. Thank you.